After 48 solid hours in New York, it was sadly time to say goodbye. It hurt to leave such an amazing city but all wounds were healed when I found myself at the Hershey's Chocolate World buhahahaha. Even for someone that isn't a big of chocolate felt like a 10 year old kid that couldn't contain their excitement. As soon as the automatic doors opened, the smell of sweet milky chocolate shot up straight through my nose. It was practically like inhaling in chocolate but hey, I certainly wasn't complaining. Like a 10 year old kid, I hopped onto the Hershey ride and took a tour of their chocolate making process. It was so so so tempting to jump off half way through the ride, start scooping out all the chocolate with my two bare hands and slurping it down like as if it was water. How could you not?? So of course when one is at Hershey's world, one would try and find the biggest Hershey Chocolate bar there is. So here it is. I was kind of disappointed to be honest. I was expecting to find a chocolate bar at least triple the size of the one I was holding. Maybe it was probably a good thing that it didn't come any bigger because dam, that bar was heavy. Imagine if there was an extremely ginourmous bar and I had dropped it... oh dear, I would of walked out as an oompa loompa. Next stop was Washington D.C. A city filled with loads of history and multiple pretty white painted buildings. HELLOOOOO OBAMA, I AM IN YOUR HOOD. First up was the US Capital Building and of course, the size of the building and it's surroundings was as enormous as most people expect it to be. Mother nature definitely showed off that day, there was not a single cloud in the sky. The giant capital building together with vibrant blue sky is a sight which I will never forget. Just stunning. Next up was President Obama's crib. It was surprisingly a lot smaller than I had imagined and sorry to disappoint peeps, Obama was not in that helicopter. He was actually in NYC the day I had visited. It seemed like him and I had swapped cities. Last but not least was a visit to the Lincoln memorial. I must admit I was pretty lucky to have visited Washington D.C. that day because the next morning, all the national museums/parks in the States were closed. If I had arrived the next day, my trek to Washington D.C. would of been a complete waste. Talk about luck! 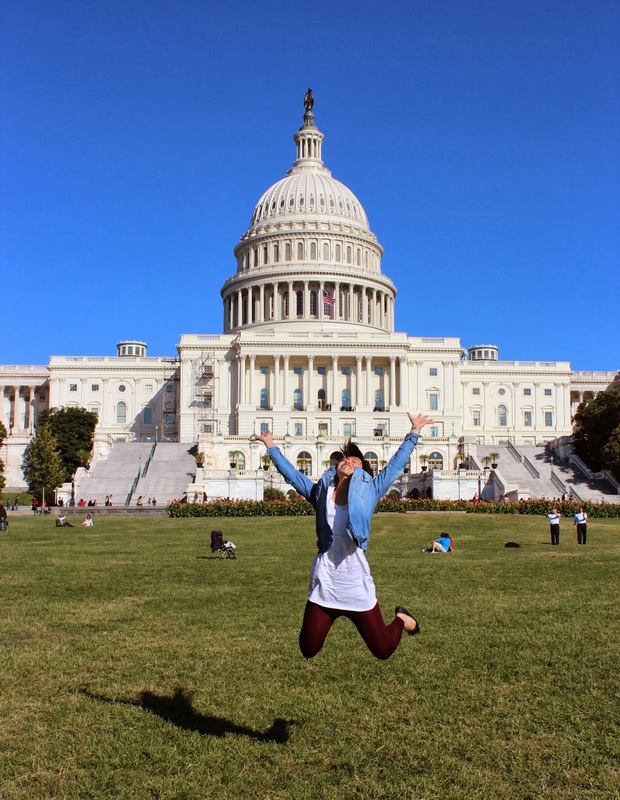 Finally it was time to bid farewell to Washington D.C. and take a trip up to Canada. After days of driving, I had finally reached the border between the States and Canada. But before crossing, it was time to fuel up with some good old buffalo wings. Carbs, carb, carbs and oh salad. There isn't much around the border but there is The Original Honey's which serves all you can eat buffalo wings. The wings come in three different flavours; original, mild and extra spicy. The extra spicy wasn't as spicy as I had expected. To me, there was a kick but my mouth wasn't on flame or anything. Not sure if its because of my tolerance levels or if it wasn't cooked as 'extra spicy'. The meat wasn't as tender as I had hoped but the best bit was the crunchy skin on all the wings. It was dangerously addictive. Alrighty peeps, so that's a wrap for now. Stayed tuned for more updates on my recent trip. Next stop, Canada. Sheer luck for just missing the government shutdown! I remember the smell of the Hersheys store. It definitely hits you. And I remember also being disappointed with the size of the bar! hehe you look so cute and happy with the Hershey's bar! Although I too would expect bigger too! 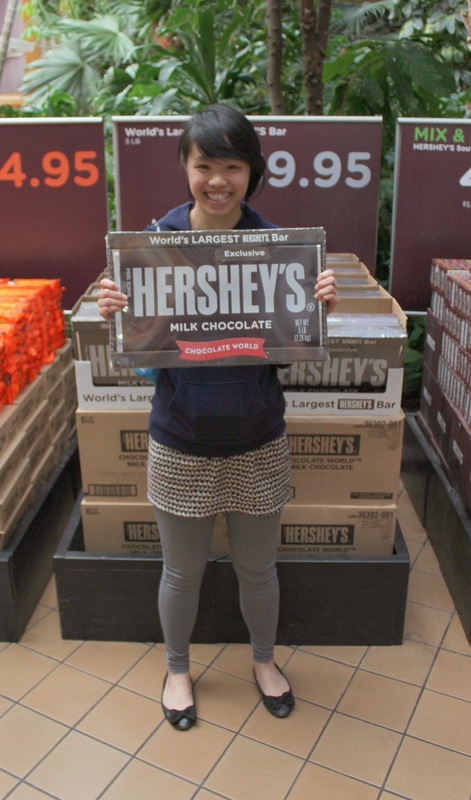 aww u look so adorable and happy with the massive hersheys! so jealous! I am so jealous! 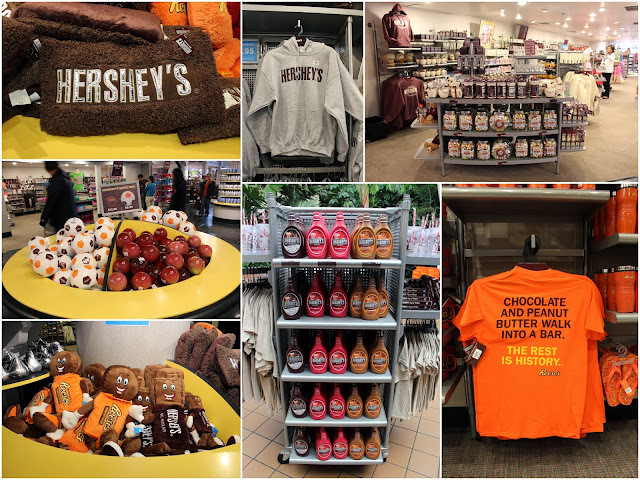 I would love to be at Hersheys World, and I think my kids would think it was heaven! Ugh I would squeal and jump too if I were in that Hersheys paradise! Really should NOT have read this post...super jealous all the chocolate and deliciousness!